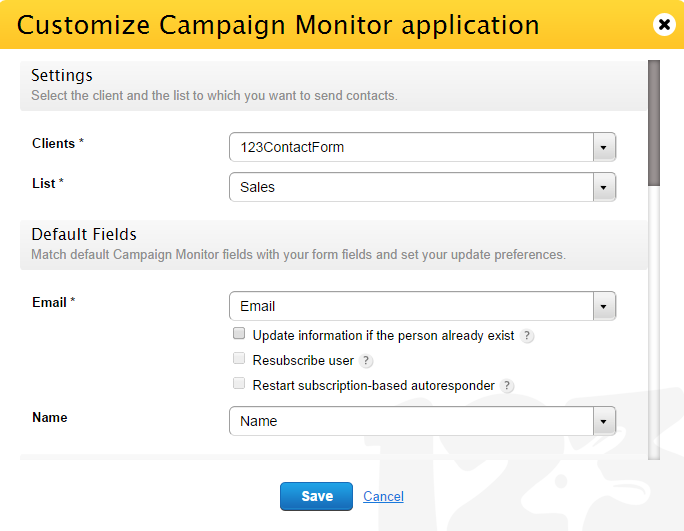 Use the 123FormBuilder – Campaign Monitor integration to add new subscribers to your Campaign Monitor mailing lists. Go to the Settings → 3rd Party Apps section of your form, hover over Campaign Monitor and click on Add. 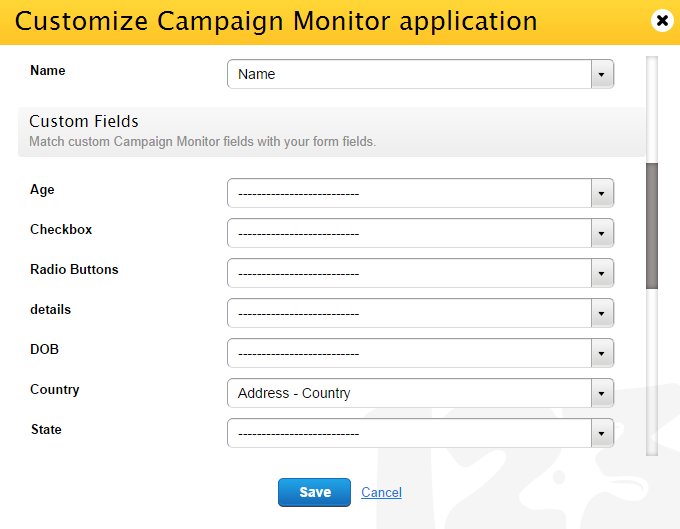 Now the Campaign Monitor app is added on your form and all you need to do is activate the app with your Campaign Monitor credentials and associate the proper fields. Click on Connect to submit the username and password of your Campaign Monitor account. If you use multiple accounts in Campaign Monitor, select one of the accounts that appear in the dropdown list, hit Continue and click on Allow in order for the two accounts (123FormBuilder and Campaign Monitor) to communicate with each other. In the Customize lightbox from 123FormBuilder, select the Client and List in Settings. In Default Fields, associate the email field of your form (which needs to be required) with the email field from Campaign Monitor and a form field for Name if needed. If you do not assign a required email field, the 123FormBuilder – Campaign Monitor integration will not work. With the 123FormBuilder – Campaign Monitor integration you can opt to update subscribers based on the email address, resubscribe them if inactive and reinclude them to your autoresponder list. Update information if the person already exist. If a user submits a form with an email address already registered in your list, all information will be updated to the respective user. Resubscribe user. Works only when the update information option is enabled. This option will resubscribe users that have been previously unsubscribed in Campaign Monitor. Restart subscription-based autoresponder Works only when the previous two options are enabled. This option will add the respective email address of the submission to the autoresponder list of your Campaign Monitor account. In Custom Fields, use the dropdown lists on the right to associate form fields with Campaign Monitor custom fields on the left. Some situations might occur when a visitors has a low internet connection. This could prevent the submission to be sent to Campaign Monitor. Upon setting your email address in Error handling, you will receive an email each time the form has been used but failed to send form data to Campaign Monitor. Don’t forget to hit Save and you are done. You can now collect new subscribers in your Campaign Monitor mailing list via 123FormBuilder online forms. If you want to adjust the settings of the 123FormBuilder – Campaign Monitor integration, just return to the Settings → 3rd Party Apps section of your form and hit the Customize button within the application box. If you require assistance, don’t hesitate to contact our Support Team at support@123formbuilder.com or via our contact form.